Bandung is the capital of West Java with many stunning natural attractions. If you are familiar with Bandung, you are definitely no stranger to a cool city and friendly locals. Not only that, Bandung is also famous for some very tasty traditional Sundanese food. If you want to vacation in Bandung for a few days, it never hurts to stay at a hotel that is comfortable and guaranteed amenities. Here are 10 of the best hotel recommendations in Bandung. Located on Jalan Sumatera Number 51, which is the center of Bandung, this 5-star hotel makes it easy for you to access shopping, shopping malls, culinary attractions and other tourist attractions in Bandung. Places like Bandung Indah Plaza, Bandung Electronic Center (BEC), etc. will be very easily accessed if you stay at this 5-star hotel. There are several types of rooms offered, including: guestroom king plus breakfast, regency king club plus breakfast, guestroom twin plus breakfast, club regency twin plus breakfast, deluxe king, deluxe twin, club regency king, and club regency twin. You can also enjoy high-class recreational facilities such as children’s pool, fitness center, tennis court, squash court, and beautiful garden. Located on Jalan Setiabudi 376, Setiabudi, Bandung. 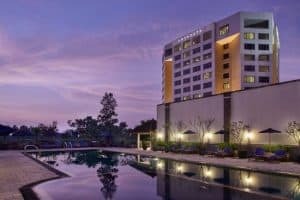 GH Universial Hotel is highly recommended for those of you who want to travel close to various tourist attractions in Bandung, such as Kampung Gajah Wonderland, West Java Cultural Park, and Dago Indah Golf. GH Universal Hotel offers several types of rooms including: superior, deluxe and suite rooms. Each room has the option of entering breakfast in a room package or not, facilitated by international cable TV channels, a fridge, shower, mini bar, and also internet access to upload photos of your tours. You can also enjoy additional facilities such as a swimming pool, children’s playground, swimming pool for children, massage, spa and beautiful garden. 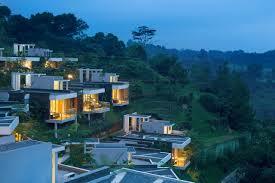 Staying at a 5-star hotel in Bandung will allow you to enjoy the beauty of Lembang. 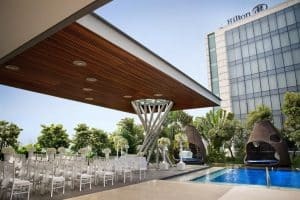 Located on Jalan Gatot Subroto 289, which is the center of Bandung, this 5-star hotel in Bandung received the title of the best 5-star hotel in Bandung. There are many variations of room packages offered, including: premier room, premier room plus breakfast, premier club, premier room plus 2 Trans Studio Bandung tickets, premier club room plus 2 Trans Studio Bandung tickets, premier club room plus breakfast, celebrity suite , and others. The location of Trans Luxury hotel which is close to Trans Studio Mall, and several landmarks in Bandung makes it easy for you to access various entertainment offered by Bandung, one of which is Trans Studio Bandung. The hotel also offers a variety of recreational facilities, such as a gym, sauna, spa, playroom for children, outdoor swimming pool with beach sand and waterfalls, and others. The coolest thing about this hotel is the dragon-shaped crystal lamp mounted on the ceiling of the main lobby. Located on Jalan Ranca Bentang 56-58, Ciumbuleuit, this 5-star hotel location in Bandung is a plateau with beautiful scenery. As a 5-star hotel, Padma has a range of first-class facilities, for example a spa and fitness center overlooking the mountain, a variety of therapeutic treatments ranging from simple massage to reflexology and shiatsu. 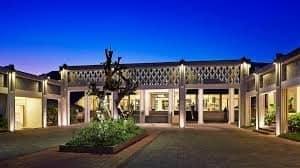 You could say you will not meet other hotels that are similar to the Padma Hotel Bandung because of the amazing views offered, buildings that are in harmony with the surrounding environment, plus cool and refreshing air. This is because the Padma Hotel Bandung buys the mountain in front of it so that it can be ascertained that the mountain scenery will be very green and beautiful. Prama Grand Preanger Hotel is located on Jalan Asia Afrika Number 81, Bandung. The location is very strategic, right in the center of Bandung which is close to tourist attractions, business areas, and shopping centers. 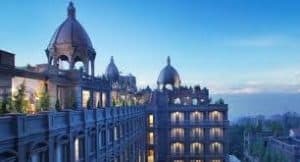 This hotel has been operating since the 1920s, with ownership rights by Aerowisata International which is a tourism and hospitality foundation in Indonesia. With high international standards, this hotel has 187 rooms with superior, deluxe, executive and suite types. The facilities available at this hotel are a hot tub, steam room, children’s pool, spa and massage services, an outdoor swimming pool, a championship center and others. Sheraton Bandung Hotel and Towers is located on Jalan Ir. H. Juanda Number 390, Dago, Bandung. 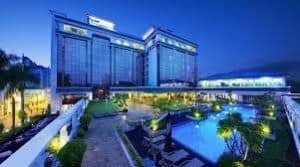 This 5-star hotel in Bandung is only about 2 km from the center of Bandung and is in a strategic location close to West Java Cultural Park, Dago Indah Golf, and Dago Pakar. 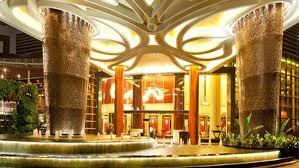 Sheraton Bandung Hotel provides 156 deluxe type rooms, deluxe garden, club, suites, executive suites, and others. All of these room types have the option to add breakfast in the package. The facilities at this 5-star hotel are very complete. For sports and recreation services, you can enjoy playing golf on the golf course, children can play at children’s clubs, besides that there are also spa and massage services, outdoor swimming pools, indoor pools, and many more. Sheraton also provides a special airport shuttle service for those from outside the city. 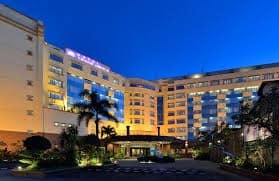 Located on Jalan HOS Tjokroaminoto Number 41-43, this 5-star hotel in Bandung is located close to various interesting places to visit, such as Istana Plaza, Pasar Baru, Braga City Walk, Parahyangan Plaza, King’s Shopping Center, Gedung Merdeka, ITC Kebon kelapa, and Riau Factory Outlets. There are many types of rooms to choose from such as rooms with king beds, rooms with 2 queen beds suitable for families, deluxe rooms, executive rooms, junior suite rooms, presidential suite rooms, and many others. You can also choose to add breakfast to your room package if needed. If you decide to stay at a 5-star hotel in Bandung, it is recommended to choose a room that has a view of the pool. The hotel is located on Jalan Resor Dago Pakar Raya 2B, Cimenyan, Bandung. With its strategic location, this hotel offers easy access to destinations that you must visit in the city of Bandung. The hotel is also famous for its quality service and friendly staff. This hotel is still a 5-star hotel in Bandung that is still new, but the facilities provided are also quite complete like 5-star hotels in Bandung in general. You can enjoy your holiday in Bandung by staying in this luxurious hotel. Moreover, most rooms in this hotel have beautiful view. 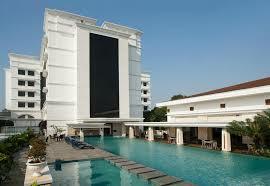 Grand Aquila Hotel is located at Jalan Dr. Djundjunan 116, Pasteur, Bandung. The hotel has classic architecture combined with modern architecture, with rooms that are wider than the average size of other hotels in Bandung, the Grand Aquila hotel has several restaurants and cafes offering various types of dishes. The restaurants here are: Noble House which serves delicious cuisine and dim sum, Café Pasteur which provides classic international and Asian dishes, and others. This hotel has 240 rooms with superior, premiere and executive types. The Papandayan Hotel is located on Jalan Gatot Subroto No. 83, Bandung. It is located close to the center of Bandung’s attractions such as Telaga Bodas Street, Bandung Supermall, Bandung Computer Center, and others. The hotel is also close to the airport, so it is very easy for you to come to Bandung by airplane. Here there are 172 rooms of the classic, premier and ambassadors types. Each room has been facilitated with free internet access, non-smoking rooms, air conditioning, a writing desk, and an en suite bathroom. Other facilities that you can enjoy to refresh yourself include a fitness center, sauna, outdoor swimming pool and massage and spa services. Those are the list of top 5 star-hotels in Bandung you can stay comfortably. Whenever you visit Bandung, you have to try stay in one of these lists above. 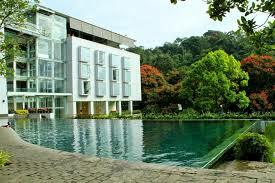 You can relax and enjoy your holiday in Bandung excitedly.